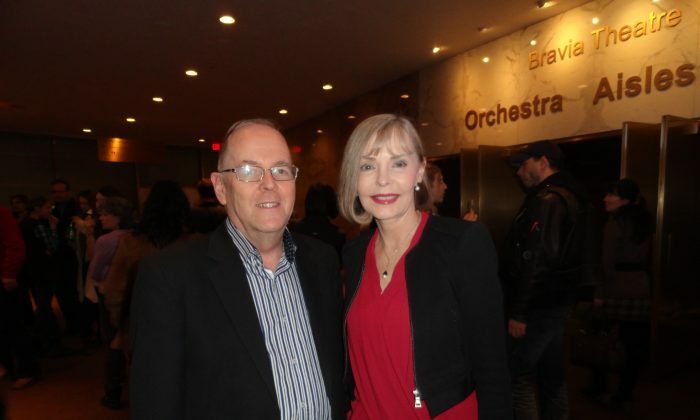 TORONTO—Jayne Hobbs and Bob Simpson saw the Shen Yun Symphony Orchestra’s concert late last year and enjoyed the unique orchestra’s performance so much that they decided to come back and see Shen Yun Performing Arts’ classical Chinese dance production as well. New York-based Shen Yun, the world’s premier classical Chinese dance and music company, travels the globe each year staging exhilarating performances that are both aesthetically beautiful and culturally rich. Outside the regular dance performance season starting in late December each year, Shen Yun’s unique orchestra holds its own concerts, which so far have only been held in North America. It is an orchestra that combines traditional Chinese instruments with Western instruments. “It is wonderful, it’s a beautiful show. We saw the orchestra version later last year and this is a wonderful follow-up. Just lovely, very enjoyable. From costumes to the dances, very, very well put out,” said Ms. Hobbs, an associate publisher for Active Life Magazine, praising the dance and music performance at the Sony Centre for the Performing Arts on Thursday evening. The many different unique features of Shen Yun all worked together to leave a high impression on Ms. Hobbs. “A combination of the screen in the back and the dancers, and the blending with the fantasy, and then from fantasy to reality and back to fantasy again, I thought it was beautifully done. The costumes, of course, they’re just fantastic,” she said. Watching Shen Yun, one gets a feeling of inner peace, Ms. Hobbs added. “The wonderful elegance of the dance and the beauty … also the formation of peace within—I think it’s just lovely. I’m just enjoying it very much,” Ms. Hobbs said. Mr. Simpson, who is now retired, also felt peacefulness through the show, conveyed through the dancers’ performance. “It’s the peace and it’s … tranquil in the meditation once you have the compassion and the thought for caring for others, and you’re getting that from the performance. The performers are doing that for the audience through their dancing,” Mr. Simpson said.